This is a guest post from Josh Wardini from 16 Best about how the decision making process affects how consumers shop. Though it is not specific to Virtual Assistants, I found the infographic very interesting and was amazed by many of the statistics (there are a lot in this infographic!!) and thought you might like to check it out too! Enjoy! 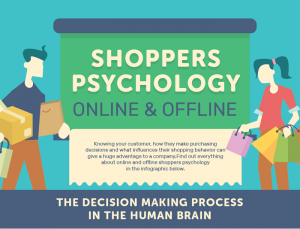 Shopping can be quite a psychological affair, whether we know it or not. Businesses, whether selling goods or services, have a few tricks up their sleeve when it comes to encouraging customers to make a purchase. Elements such as the color of wording on signs, the music that is playing, and the smell in the air can all have an influence on the shopping buying decisions. Many people would assume there is a difference when it comes to the psychology of purchasing a service compared to the psychology of buying a product, but often this is not the case at all. For example, color can also be used when one sells services, as color increases brand recognition by 80%. Different colours have the power to change consumer behavior. Advertise a service in red, for example, and you could attract impulse shoppers, or use blue hues and shoppers on a budget may be interested. The possibility of getting a discount is also a major influence for shoppers, and brands around the world have been using this strategy for years. A good example is Budget, a car rental company from New Jersey that utilizes a Best Price Guarantee to offer discounts to their clientele, and this tactic has proven very efficient at keeping customers, acquiring new ones and developing brand loyalty. The wording used to advertise and describe a product can also affect consumer behaviour. 60 percent of customers are more likely to buy a product or service that has the word ‘guaranteed’ used to describe it. Additionally, 68% of consumers have also said that a stored signage reflects the quality of its products or services. If consumers are buying online, then different things may affect the purchasing decision. Features that are likely to have an influence are discounts and offers, trustworthy reviews, a mobile friendly webpage, and the brand’s reputation as a whole, to name just a few. Guest post by Josh Wardini: Josh Wardini, Editorial Contributor and Community Manager at 16best.net. With a preliminary background in communication and expertise in community development, Josh works day-to-day to reshape the human resource management of digitally based companies. When his focus trails outside of community engagement, Josh enjoys the indulgences of writing amidst the nature conservations of Portland, Oregon.